Akabane virus is a member of the virus family Bunyaviradae. It can cause disease in cattle, sheep and goats, and is spread by insect. The virus is characterised by the development of lesions in the foetus of susceptible animals. The disease was first recognised in Australia in 1974. Currently, akabane activity is widespread throughout both Northern and Eastern Australia. 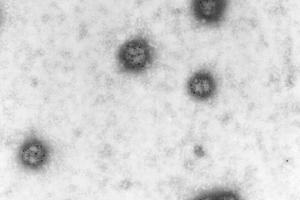 This transmission electron micrograph shows Akabane virus prepared using grid cell culture technique and incubated with anti-Akabane antibodies and colloidal gold.